Iraq has become a "battleground" for al-Qaeda with "appalling consequences" for the Iraqi people, MPs have warned. The Commons foreign affairs committee says the failure to establish law and order has created a "vacuum" into which militias and criminals have poured. In a report on the war on terrorism they urge ministers to encourage Muslim countries to send forces. The wide-ranging report also questions whether there needs to be new rules on the use of pre-emptive military force. Donald Anderson, the committee's Labour chairman, said the Iraq war might well have increased the terror threat in the short term, although it was too early to assess its long term impact. The report is the latest instalment of the MPs' long-running investigation into the war against terrorism. The MPs blame the violence on a range of groups, including ex-members of Saddam Hussein's regime, local Islamists, criminal gangs and al-Qaeda. 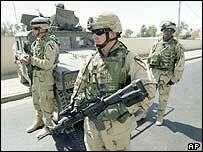 "Iraq has become a 'battleground' for al-Qaeda, with appalling consequences for the Iraqi people. "If there were not that support to help the Iraqi Government in terms of security, in the short term there is a real danger of Iraq becoming a failed stated that would be a danger not only to its own fragmented groups... but to the countries in the region," he said. The MPs also question whether international law needs to be changed to take account of the new terror threat. Under current laws, nations can use pre-emptive action but only against an imminent threat. The report says that may need reassessing, but care should be taken to make sure new laws cannot be abused by states pursuing their own interests. It argues the government should "set out how, in the event of the legitimisation of the doctrine of anticipatory self defence, it will persuade its allies to limit the use of the doctrine to a 'threat of catastrophic attack'". Afghanistan is another country which seriously worries the MPs, with Conservative committee member Sir John Stanley saying its security situation was "on a knife edge". The MPs also say the war against Afghan drugs, which account for 90% of heroin on British streets is being lost.